The Wheatbelt Science Forum is an annual event presented by the Inland Lighthouse Network. Held over two days in Wongan Hills, the forum is designed to bring advanced science concepts to middle-school children (Years 5-8) of the Wheatbelt and their teachers. This year’s theme was Science, Technology, Engineering and Maths (STEM). Wheatbelt NRM jumped at the chance to contribute for a second year by preparing two workshops; one to present the use of Geographic Information Systems (GIS) in land management, and the second to demonstrate the use of STEM in managing our regions’ biodiversity. Around 120 students participated in Wheatbelt NRM’s workshops from schools in Toodyay, Koorda, Moora, Bencubbin, Dowerin, Kalannie and Trayning. Wheatbelt NRM staff rotated each class through a three-station workshop consisting of a computer-based tutorial in the use of Google Earth Pro™ software, a hands-on ‘how to use a GPS’ activity and a drone demonstration presented by local company Sky High Quads. Following a brief discussion of the varied applications of using spatial data in land management, the students were incredibly enthusiastic participants and eager to explore the world in a virtual tour of the Earth, Moon, Mars and the sky using Google Earth Pro. They needed little guidance from GIS Support Officer Dimity Boggs to master the tools in the software and once they knew what to do, their imaginations guided them to places you used to have to board an aeroplane to see. Regional Landcare Facilitator Leigh Whisson directed small groups of students in using GPS units to follow a ‘treasure hunt’ through bushland adjacent to the venue. The students quickly adopted the technology and most finished the task of locating the prize at the end of the trail within the allocated 15 minutes. It was interesting that some children preferred to be using technology outside in the bush and found this activity extremely fun. Dale and Bronwyn from Sky High Quads stole the limelight with their drone display. Dale showed the children how to operate the drone, discussed some of its many applications and challenged the students in an activity to spell out the words STEM and WHEATBELT SCIENCE FORUM using their bodies while the drone captured an aerial image of their efforts. The students seemed to accept that drone technology is an expanding field of science and had interesting thoughts on the potential future applications and challenges of using drones in our society. 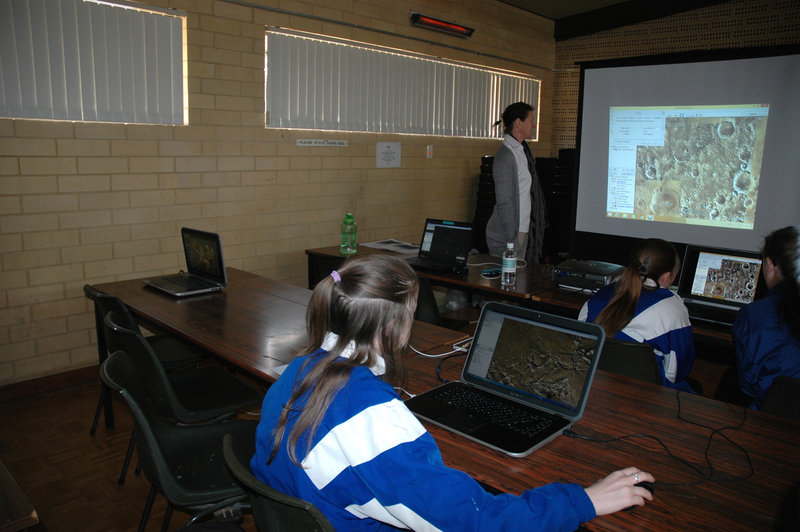 Based on an actual Wheatbelt NRM project run in 2015-2016 using predator control to manage an endangered rock wallaby population in the region, Wheatbelt NRM staff engaged the students in a series of activities using maps, models and camera trap imagery in land management decision making. The children were asked to translate an aerial image of wallaby habitat into a 3D model landscape out of sand and other resources. They were assigned different roles in the wallaby habitat, and after viewing camera trap footage of wallabies in their natural habitat, discussed and role-played their role in the management of the wallaby, the impact of weeds and predators and the importance of landscape connectivity. After this they used their 3D landscape models to make recommendations of priority areas of management. Following the mapping activity, a game was played where students were separated into groups; farmer, wallabies, cats and foxes. Wallabies were required to hop on one leg to a feeding area by using safe zones (hoops), while cats and foxes who could run normally tried to eat them. Throughout the game safe zones were taken away to represent habitat degradation and farmers were introduced to implement feral animal control. Students remarked that while it was a fun game, the more habitat loss suffered, and the fewer farmers there were to assist the wallabies, the harder it became to reach the feeding area. Students were then shown maps of where feral animal control is currently being undertaken by Wheatbelt NRM and were encouraged to discuss ways that their friends and family could help stop native animal decline. Wheatbelt NRM would like to thank Velu Ramasamy and the Inland Lighthouse Network for organising this great event. We look forward to being involved again in 2017!